The Hillsboro Lighthouse guides vessels from the Atlantic Ocean into Hillsboro Inlet near Pompano Beach and Lighthouse Point. The tower was built in 1906 and is located on the peninsula on the north side of the inlet. A museum operated by the Hillsboro Lighthouse Preservation Society is located on the south side of the inlet across from the lighthouse at Hillsboro Inlet Park. The preservation society was founded in 1997 to preserve the lighthouse and grounds. A statue of the Barefoot Mailman graces the lighthouse site. It memorializes the several postal carriers who carried mail on a mail route along the beach from 1885 to 1892. The 68 mile route from Palm Beach to the Miami area required the mailmen to row boats for 28 of the miles and walk the rest of the way on the firm sand beach. One of the mailmen, James E. Hamilton, disappeared while walking the route in 1887 and was presumed to have either drowned or been killed by an alligator or shark while trying to swim across Hillsboro Inlet. The lighthouse is open periodically for tours, and you are required to take a boat from a nearby dock to visit it. The fee for the boat ride and lighthouse visit is $25/person. You are allowed to climb the lighthouse tower on these tours. There are 175 steps on the spiral staircase that takes you to the top. It is advisable to call the museum at 954-942-2102 for information on tour dates and times. The museum is open Sunday, Tuesday and Thursday from 1100am to 300pm, and is open for tours on Saturday and Sunday from 1000am to 300pm. The park is physically located at 2700 N. Ocean Boulevard in Pompano Beach. 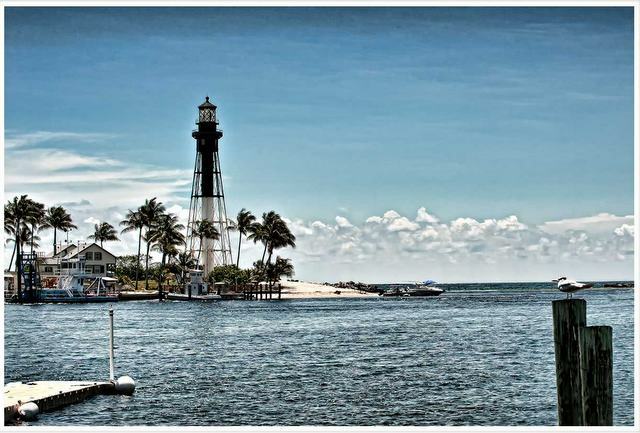 Places of interest near the lighthouse include Hillsboro Inlet and the nearby towns and Cap's Place, a historic restaurant in Lighthouse Point.